Pop music continuously evolves along with the term's definition. According to music writer Bill Lamb, popular music is defined as "the music since industrialization in the 1800s that is most in line with the tastes and interests of the urban middle class." The term "pop song" was first used in 1926, in the sense of a piece of music "having popular appeal". Hatch and Millward indicate that many events in the history of recording in the 1920s can be seen as the birth of the modern pop music industry, including in country, blues, and hillbilly music. According to the website of The New Grove Dictionary of Music and Musicians, the term "pop music" "originated in Britain in the mid-1950s as a description for rock and roll and the new youth music styles that it influenced". 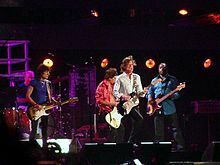 The Oxford Dictionary of Music states that while pop's "earlier meaning meant concerts appealing to a wide audience [...] since the late 1950s, however, pop has had the special meaning of non-classical mus[ic], usually in the form of songs, performed by such artists as the Beatles, the Rolling Stones, ABBA, etc." Grove Music Online also states that "[...] in the early 1960s, [the term] 'pop music' competed terminologically with beat music [in England], while in the US its coverage overlapped (as it still does) with that of 'rock and roll'". As of 2011[update], "You've Lost That Lovin' Feelin'" ranks as the most frequently played song in US radio history. It is described by music writers Nick Logan and Bob Woffinden as "the ultimate pop record". In the 1940s improved microphone design allowed a more intimate singing style and ten or twenty years later, inexpensive and more durable 45 r.p.m. records for singles "revolutionized the manner in which pop has been disseminated". This helped to move pop music to 'a record/radio/film star system'. Another technological change was the widespread availability of television in the 1950s; with televised performances, "pop stars had to have a visual presence". In the 1960s, the introduction of inexpensive, portable transistor radios meant that teenagers in the developed world could listen to music outside of the home. Multi-track recording (from the 1960s); and digital sampling (from the 1980s) have also been utilized as methods for the creation and elaboration of pop music. By the early 1980s, the promotion of pop music had been greatly affected by the rise of music television channels like MTV, which "favoured those artists such as Michael Jackson and Madonna who had a strong visual appeal". A recent study held by New York University  in which 643 participants had to rank how familier a pop song is to them, songs from the decade 1960-69 turned out to be the most memorable, a lot more than songs from recent years 2000 to 2015. ^ a b Gilliland, John (1969). "Show 1 – Play A Simple Melody: Pete Seeger on the origins of pop music" (audio). Pop Chronicles. University of North Texas Libraries. ^ a b c d e f g S. Frith, W. Straw, and J. Street, eds, The Cambridge Companion to Pop and Rock (Cambridge: Cambridge University Press), ISBN 0-521-55660-0, pp. 95–105. ^ D. Hatch and S. Millward, From Blues to Rock: an Analytical History of Pop Music (Manchester: Manchester University Press, 1987), ISBN 0-7190-1489-1, p. 1. ^ R. Serge Denisoff and William L. Schurk, Tarnished Gold: the Record Industry Revisited (New Brunswick, NJ: Transaction Publishers, 3rd edn., 1986), ISBN 0-88738-618-0, pp. 2–3. ^ Moore, Allan F. (2016). Song Means: Analysing and Interpreting Recorded Popular Song. Routledge. ISBN 978-1-317-05265-4. ^ Musicologist Allan Moore surmises that the term "pop music" itself may have been popularized by Pop art. ^ Lamb, Bill (29 September 2018). "What Is Pop Music?". ThoughtCo. ^ J. Simpson and E. Weiner, Oxford English Dictionary(Oxford: Oxford University Press, 1989). ISBN 0-19-861186-2, cf. pop. ^ D. Hatch and S. Millward, From Blues to Rock: an Analytical History of Pop Music, ISBN 0-7190-1489-1, p. 49. ^ a b Kenneth Gloag in The Oxford Companion to Music (Oxford: Oxford University Press, 2001), ISBN 0-19-866212-2, p. 983. ^ a b T. Warner, Pop Music: Technology and Creativity: Trevor Horn and the Digital Revolution (Aldershot: Ashgate, 2003), ISBN 0-7546-3132-X, pp. 3–4. ^ "Van's Brown Eyed Girl hits the 10 million mark in US". BBC. 5 October 2011. ^ Steve Sullivan (2013). Encyclopedia of Great Popular Song Recordings, Volume 2. Scarecrow Press. pp. 101–103. ISBN 978-0-8108-8296-6. ^ W. Everett, Expression in Pop-rock Music: A Collection of Critical and Analytical Essays (London: Taylor & Francis, 2000), p. 272. ^ J. Shepherd, Continuum Encyclopedia of Popular Music of the World: Performance and production (Continuum, 2003), p. 508. ^ V. Kramarz, The Pop Formulas: Harmonic Tools of the Hit Makers (Mel Bay Publications, 2007), p. 61. ^ Winkler, Peter (1978). "Toward a theory of pop harmony", In Theory Only, 4, pp. 3–26. ^ Sargeant, p. 198. cited in Winkler (1978), p. 4. ^ Winkler (1978), p. 22. ^ "Making Arrangements—A Rough Guide To Song Construction & Arrangement, Part 1". Sound on Sound. October 1997. Archived from the original on 8 May 2014. Retrieved 8 May 2014. ^ Blake, Andrew (2009). "Recording practices and the role of the producer". In Cook, Nicholas; Clarke, Eric; Leech-Wilkinson, Daniel (eds.). The Cambridge Companion to Recorded Music. Cambridge University Press. p. 45. ISBN 978-1-139-82796-6. ^ Pareles, Jon (October 31, 2008). "Orchestral Pop, the Way It Was (More or Less)". The New York Times. Retrieved July 4, 2013. ^ Hewitt, Paolo; Hellier, John (2015). Steve Marriott: All Too Beautiful. Dean Street Press. p. 162. ISBN 978-1-910570-69-2. ^ Reynolds, Simon (2006). "New Pop and its Aftermath". On Record: Rock, Pop and the Written Word. Routledge. p. 398. ISBN 978-1-134-93951-0. ^ Willis, Paul E. (2014). Profane Culture. Princeton University Press. p. 217. ISBN 978-1-4008-6514-7. ^ a b Moore 2016, p. 202. ^ a b Christgau, Robert (2014). "Anti-Rockism's Hall of Fame". The Barnes & Noble Review. Retrieved August 18, 2015. ^ "New study finds pop music has gotten extremely depressing but also more fun to dance to". The FADER. Retrieved 2018-05-21. ^ "Today's pop music really IS more depressing than 30 years ago". Mail Online. Retrieved 2018-05-21. ^ McGee, Alan (August 20, 2008). "Madonna Pop Art". The Guardian. Retrieved April 17, 2013. ^ a b c d e D. Buckley, "Pop" "II. Implications of technology", Grove Music Online, retrieved 15 March 2010. ^ Wallisch, Pascal; Passman, Ian Joseph; Spilka, Nathaniel Hugo; Philibotte, Sara Jordan; Spivack, Stephen (2019-02-06). "Who remembers the Beatles? The collective memory for popular music". PLOS ONE. 14 (2): e0210066. doi:10.1371/journal.pone.0210066. ISSN 1932-6203. PMC 6364888. PMID 30726220. ^ "The greatest decade for pop music has been revealed (according to science)". Smooth. Retrieved 2019-03-31. ^ Edmondson, Jacqueline, ed. (2013). Music in American Life: An Encyclopedia of the Songs, Styles, Stars, and Stories that Shaped our Culture. ABC-CLIO. pp. 317, 1233. ISBN 978-0-313-39348-8. ^ a b Loss, Robert (August 10, 2015). "No Apologies: A Critique of the Rockist v. Poptimist Paradigm". PopMatters. ^ J. Kun, Audiotopia: Music, Race, and America (Berkeley, CA: University of California Press, 2005), ISBN 0-520-24424-9, p. 201. ^ "Star profiles" in S. Frith, W. Stray and J. Street, The Cambridge Companion to Pop and Rock (Cambridge University Press, 2001), ISBN 0-521-55660-0, pp. 199–200. ^ a b c P. Manuel, "Pop. Non-Western cultures 1. Global dissemination", Grove Music Online, retrieved 14 March 2010. ^ "K-Pop, la música y la moda 'rarita' coreana que arrasa la red". ^ "Why aren't there many mixed gender K-pop groups?". SBS PopAsia. Kent, Jeff, (1983) The Rise and Fall of Rock, Witan Books, ISBN 0-9508981-0-4. Lonergan, David F., (2004) Hit Records, 1950–1975, Scarecrow Press, ISBN 0-8108-5129-6. Negus, Bob, (1999) Music Genres and Corporate Cultures, Routledge, ISBN 0-415-17399-X. This page was last edited on 16 April 2019, at 18:40 (UTC).